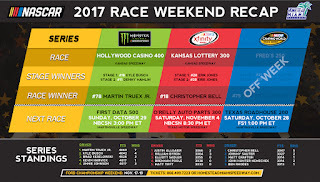 · Martin Truex Jr. won the 17th annual Hollywood Casino 400 Monster Energy NASCAR Cup Series (MENCS) race at Kansas Speedway Sunday afternoon. It was the final of the three races in the Round of 12 of the MENCS playoffs. It is Truex’s 14th win in 437 career MENCS races and his series-high seventh victory in 32 races this year. He now has won three of the six playoff races this year. · Overall, today’s finish marked Truex’s 22nd top-10 and 15th top-5 in 32 races of 2017. · This was Truex’s second win in 19 starts at Kansas with his first victory there coming on May 13 of this year. · Truex’s seven wins are the most in a MENCS season since Matt Kenseth won seven races in 2013. · Of Truex’s seven wins on the year, six have come at 1.5 mile tracks, the most-ever wins in a season on tracks of this distance in MENCS history. The previous record was held by Carl Edwards (5 in 2008). · This marked the 17th straight playoff race that was won by a driver who was still alive in the playoffs. The streak dates back to the 2015 Ford EcoBoost 400 on November 22 at Homestead-Miami Speedway, which was won by Kyle Busch. · Kurt Busch (2nd) posted his 14th top-10 finish in 32 MENCS races this year and his sixth in the top-5. It was his best finish since he won the season-opening Daytona 500 on February 26. · Ryan Blaney (3rd) accounted for his 12th top-10 finish in 32 races this year and fourth top-5. · Ty Dillon (16th) was the highest finishing rookie. · Kyle Busch won Stage 1 of today’s race while Denny Hamlin took Stage 2. · The following are the playoff standings entering the Round of 8, which commences next Sunday at Martinsville Speedway. The Playoffs culminate with the Ford EcoBoost 400 at Homestead-Miami Speedway on Sunday, November 19. · In 12 career MENCS starts at Homestead-Miami Speedway, Martin Truex Jr. has recorded seven top-10 finishes and three top-5 showings. He was part of the Championship 4 in the 2015 Ford EcoBoost 400 when he finished 12th. · Christopher Bell won the 17th annual Kansas Lottery 300 NASCAR XFINITY Series (NXS) race at Kansas Speedway on Saturday. It is his first victory in five career XFINITY Series starts, all of which have been this year. · For Bell, it was his third top-10 and second top-5 showing in five NXS starts this year. He became the first driver to get his first career NXS win at Kansas Speedway. · The race marked the first of three races in the Round of 8 in the XFINITY Series playoffs. · Tyler Reddick Jr (2nd) posted his fifth top-10 and third top-5 finish in 17 NXS races this year. · Ryan Blaney (3rd) amassed his 10th top-10 and top-5 showing in 11 NXS races this year. · William Byron (4th) was the highest finishing rookie as well as the highest finisher among the eight remaining NXS playoff drivers. 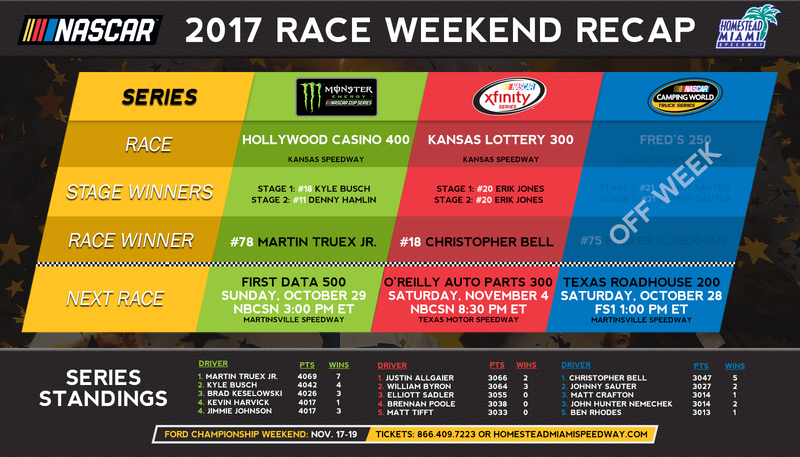 · Erik Jones set a record for the most laps led (186) in an NXS race at Kansas Speedway. · Five of the top 10 finishers were playoff drivers. · The following are the standings following the first of three races in the Round of 8 in the 2017 NXS playoffs. The Playoffs culminate with the Ford EcoBoost 300 XFINITY Series championship race at Homestead-Miami Speedway on Saturday, November 18. · The NASCAR Camping World Truck Series was off this week. They will resume action next Saturday at Martinsville Speedway. · The following are the playoff standings heading into the Round of 6 in the NCWTS playoffs, which will commence next week at Martinsville. The Playoffs culminate with the Ford EcoBoost 200 Camping World Truck Series championship race at Homestead-Miami Speedway on Friday, November 17.